You can now use the steam server browser by clicking on Steam -> View -> Servers -> Change Filters and select Squad as the game. You guys can use this if you would like to have auto-retry to join full servers. This'll come in handy, thanks for the tip! All we need now is a fully functional in game server browser. Really good stuff, will test this out tomorrow. 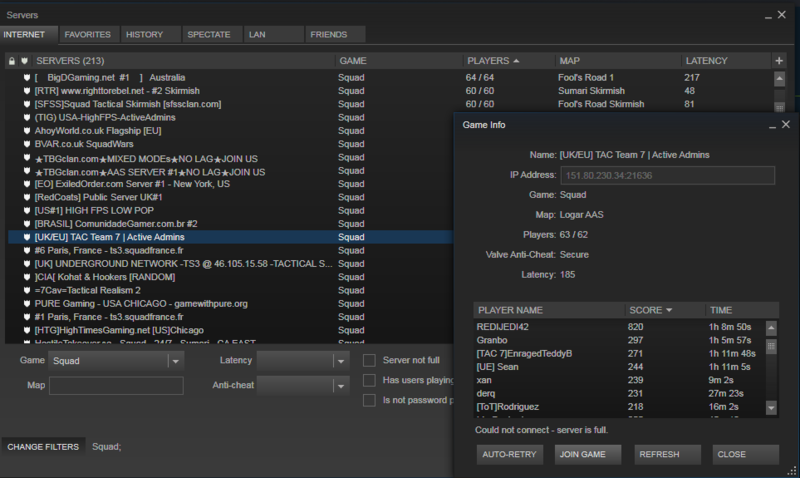 You can now use the steam server browser by click on Steam -> Servers -> Change Filters and select Squad as the game. This just made life that much easier! Thanks! Also, joining doesn't seem to work if you already launched the game and are sitting in the main menu. 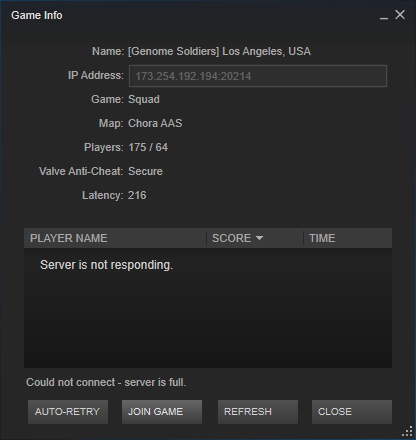 The Steam server thing doesn't seem to work right. I tried joining a server with 68 out of 66 players, which I guess means it's full with 2 more players in the queue. I set Steam to auto-retry and auto-join. I've been sitting here 30 minutes and now it's 80/66, and I can see in the player list that at least 10 new players have joined the server in that time, yet it hasn't let me join the server yet even though I was ahead of them in the queue. What gives? Edit: I tried joining non-full servers and it just connected me to the wrong server 3 times in a row (each time sending me to a completely empty server instead of the one I chose). After the 1st two times I checked the name of the server just to be sure it wasn't coincidentally re-starting and yep, it's definitely making me join the wrong server. What works and we test it with teammate. If one is connected to server and friend "join in to game" or Connected guy send an invitation to connect. We tested it at no full populated server. In both case it worked well. Friend was connected in to correct server. It's a new Steam feature? Yeah it would appear that the server fails to update the removal of leaving players or something along those lines, not sure if it's the same problem but it's causing my server to fall off the trackers with NA player count or just showing offline. Yes, as mentioned in other threads we have a known bug with disconnected players still showing as connected in steam that we are working on. Is there a website version of this that's outside of the Steam app? For years I've begged Steam to allow font size increases or "zoom" in their store browser. I can't read that sheet from my couch ;) Think it's been that way since I was playing DOD at 800x600.